The P21S Super Absorbing Drying Towel is super absorbent for quick spot-free drying. Unique properties keep this towel damp, flexible, and easy to use. Measures 12" x 12". If you’re going to put the effort into hand washing your car, then we don’t think that drying it off should be a lot of work. Tens of thousands of customers have found the P21S Super-absorbing Drying Towel to be perfect for the task. 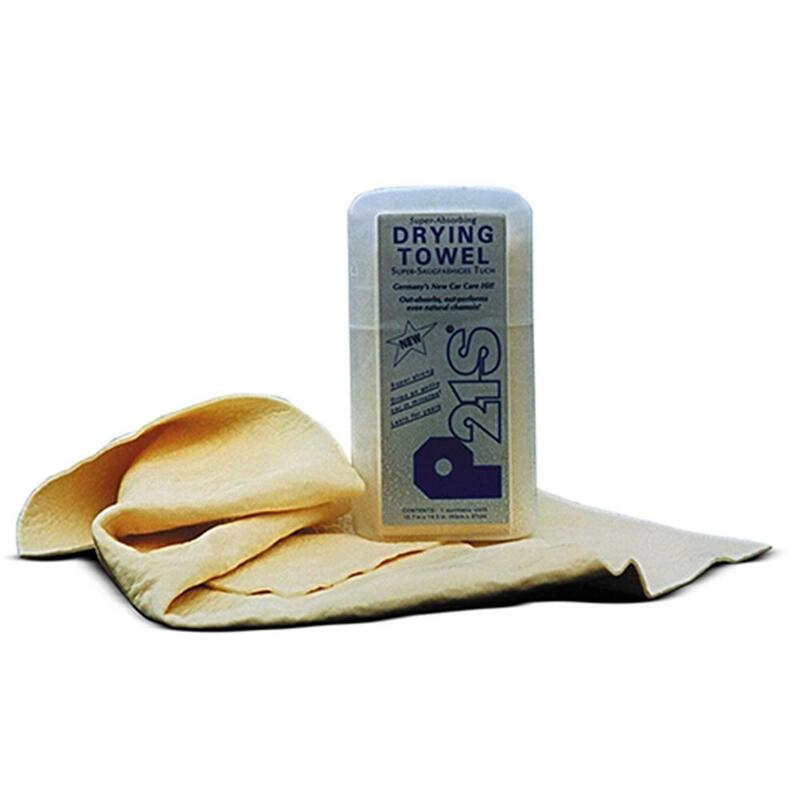 Unlike a stiff as a board chamois that you have to soak and work to get ready, the P21S Drying Towel pops out of its plastic case ready to go. Its amazing absorbancy provides no-streak, lint-free drying of an entire car in minutes. Thanks to its handy plastic pouch, your P21S towel can be kept in the glove box ready to go for that surprise rain shower or wipe up job. Made from 100% biodegradable materials. The P21S® Auto Care line stands for “factory approved” automotive care of the highest caliber, made for people who know quality when they see it. You don’t have to own a German-made automobile to appreciate these products either, just a vehicle you think is worth taking care of. If you do, we think you’ll feel that spending a bit more on P21S® products represents a worthwhile investment.